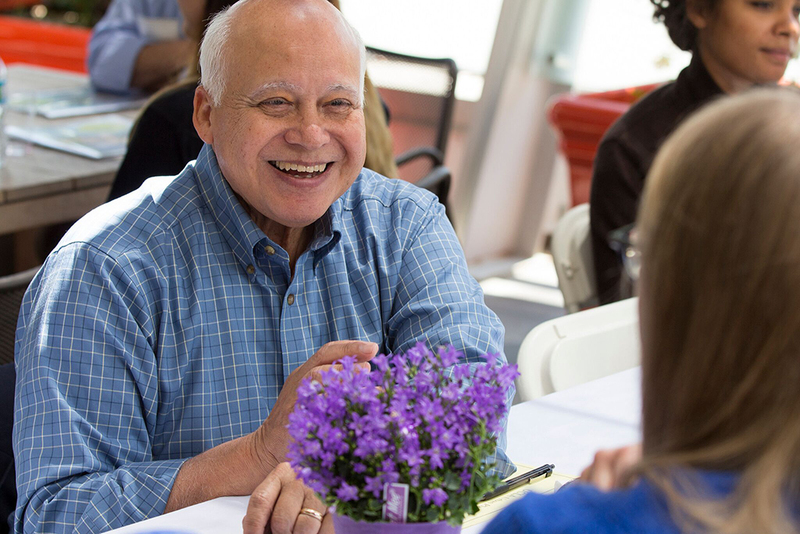 For more than 40 years, UCLA’s Department of Urban Planning has been a leading center of innovation and action. Consistently ranked among the nation’s top planning programs, we study urgent and topical issues at multiple scales and using interdisciplinary approaches – from community development in Southern California to global environmental degradation. Join leading faculty, accomplished alumni and the very best fellow students to study planning in one of the world’s great cities. Enjoy a short video about our program’s impact on communities here. 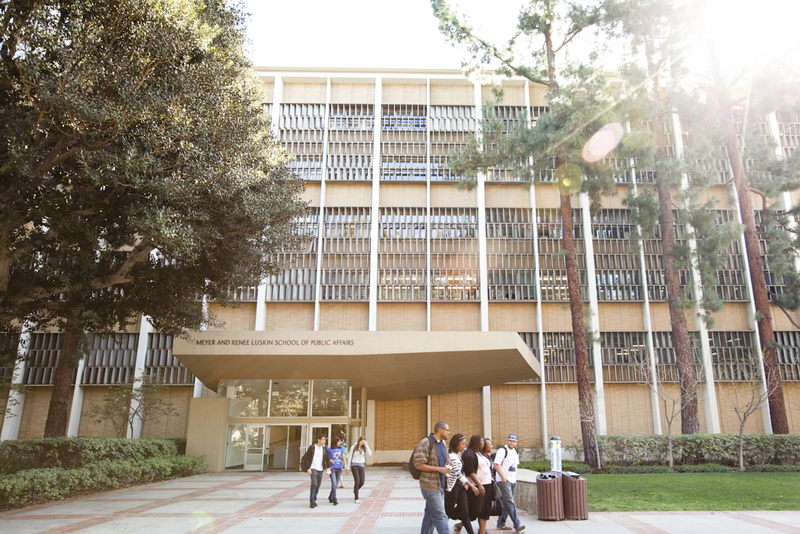 National rankings place UCLA faculty as the most influential in North America. Smart, accomplished, diverse, passionate change agents, at the forefront of linking research to action. Through critical analyses of public policies, plans, and programs, and the development of institutions that empower people at the grassroots. Melding theory, policy and planning practice, and skill building to train our students in effective professional practice and advanced research. Master’s students concentrate in one or more areas of study related to housing, economic development, environmental planning, design, regional and international development, and transportation. Our student body is 52% female and 58% students of color. Students have lived and worked in countries all over the world. Merit-based and need-based awards for master’s students support our commitment to diversity and social justice. Ph.D. students are typically fully funded for four years. Our Ph.D. program is one of the top five producers of planning faculty in the U.S. And 95% percent of our master’s graduates are employed within one year of graduation. UCLA offers action-oriented study in arguably the most dynamic region in the world. Recruitment events for prospective students take place every fall quarter. Please check back for updates. Please plan to join us for the online events below! Click the event title to register. 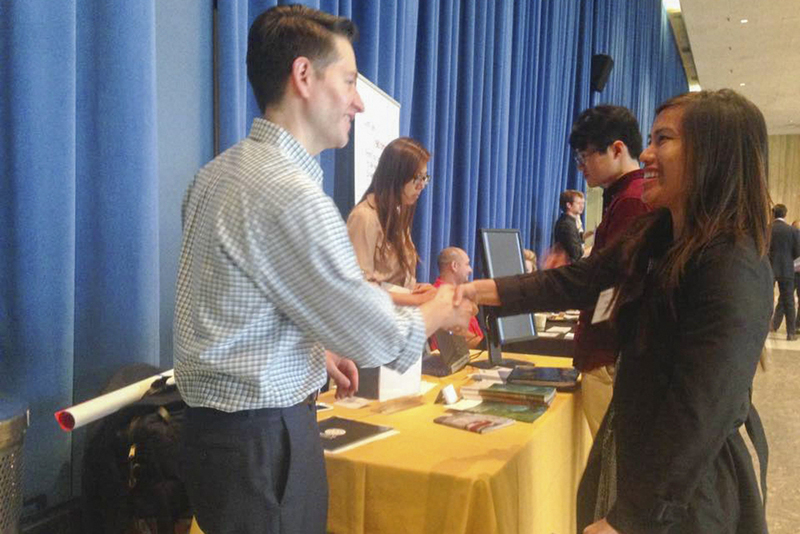 Stop by the Luskin booth at one of the 2018 Graduate School Fair events! Click each location to learn more about the fairs. Note: Schedule subject to change without notice. Schedule your visit. Visits are encouraged Mondays through Thursdays, when we offer courses. Planners change the world — by shaping cities and regions, and the lives and livelihoods of those in them. Affordable housing, good jobs, clean air and water, safe parks, lively culture and vibrant streets are all on planners’ to-do lists. 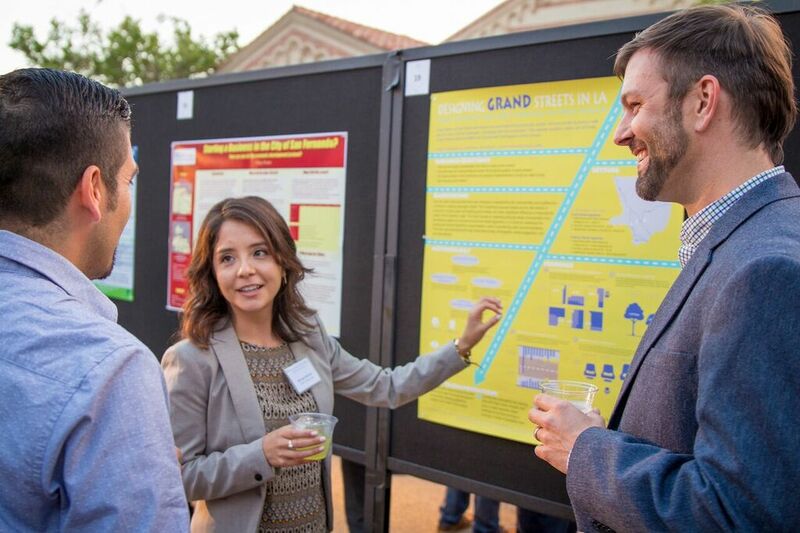 As a UCLA Luskin Urban Planning student you will be trained as a generalist — in economic analysis, law, statistics, history and urban studies — and as a specialist in one or more areas: community development, environmental assessment, housing, international and regional planning, transportation or urban design. Changing the world is a challenging, important, complex, exciting and dynamic job. You have the power to make it happen. Learn more about Areas of Concentration, Concurrent Degree and Certificate programs on our Academic Programs page. Don’t miss course syllabi, student groups, international opportunities, and other great resources on the For Our Students page. View Student Projects, too! Previous experience in planning, a planning-related field or community development is recommended. A minimum grade-point average of 3.0 (on a 4.0 scale), or its equivalent, for the last two years of undergraduate study. Our program is famous for producing outstanding planning scholars and teachers through its distinct mix of three program elements: top faculty in critical fields, a flexible curriculum, and superb opportunities for important and progressive research. For a basic overview of the Ph.D. in Urban Planning, visit our Academic Programs page. For an in-depth look at policies, procedures, and a year-by-year outline of practices, visit the Ph.D. Handbook page. Resources such as course syllabi, student groups, and international opportunities can be found on the For Our Students page. View student dissertation information here. Student profiles to come! We hope that our PhD students would remain nearly fully funded for the duration of their studies, by either fellowship awards (stipend) or teaching and research assistantships (salary). Your funding package is included in your departmental letter of acceptance. Bio: Aujean Lee is a doctoral student and a graduate student researcher for the UCLA Center for the Study of Inequality. 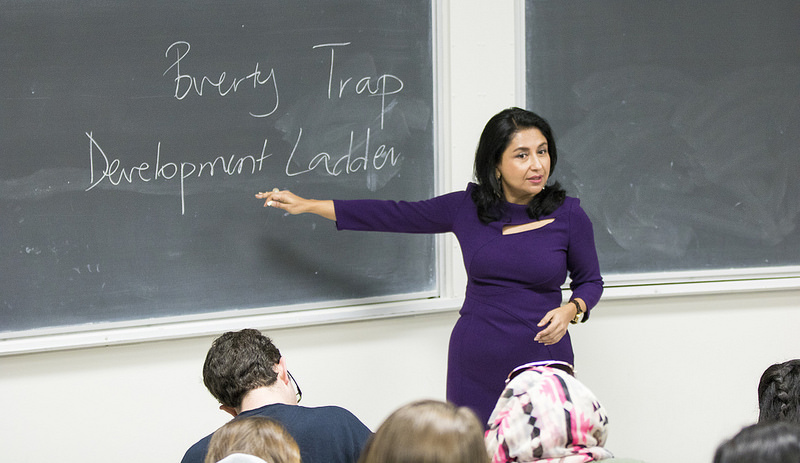 Her research examines how community development and housing impacts underserved communities. These interests grew out of her experience working with Asian American and civil rights nonprofits in Los Angeles including the K. W. Lee Center for Leadership, the Japanese American Citizens League, and Asian Americans Advancing Justice-Los Angeles. Her master’s thesis analyzed the impact of the foreclosure crisis on Asian American communities and Asian American-serving nonprofit organizations. Before beginning graduate school, she was the assistant director for the UCLA Center for EthnoCommunications, where she helped produce student documentaries that focused on various community-based issues. 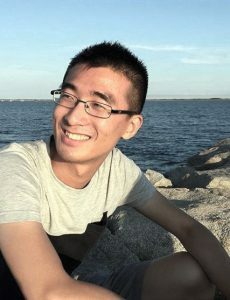 Bio: Yiwen is a doctoral student at the Department of Urban Planning at UCLA Luskin. His research interests include housing affordability, neighborhood and poverty, transportation, urban economics, and international development. His current research projects include topics on the Low Income Housing Tax Credit program, suburban street with and parking policy, gentrification issues in New York City, etc. 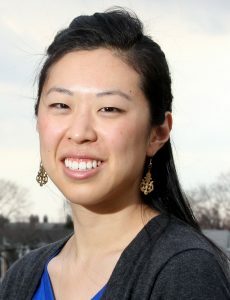 Yiwen is also a research affiliate of the Furman Center for Real Estate & Urban Policy at New York University. 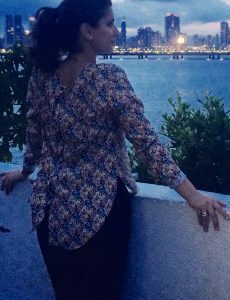 Bio: Shafaq Choudry is a Master in Urban and Regional student with a dual concentration in TPP and DD. Her special interest in the equitable and inclusive development of cities across Latin America led to enriching opportunities to lead research in Panamá and México as an International Pathway Practice Fellow, Global Public Affairs student and partnership with CTS-EMBARQ under the Mexico City Comprehensive Project. She is invested in learning about innovative planning practices and policies supporting the growth of affordable, transit-oriented and culturally vibrant cities that promote access, inclusion and opportunity. Prior to graduate studies, Shafaq worked as a Community Planner at non-profit organizations and government agencies on public space revitalization initiatives, active transportation plans and comprehensive planning. After graduation in June, she hopes to work in an organization with national and international interests in equitable development. Shafaq grew up in Venezuela, gained community-base experience working with culturally rich and low-income neighborhoods in Chicago and is a native speaker of Spanish, Hindi and Urdu. For admission and fellowship consideration to Fall Quarter 2018, the departmental deadline for Master’s in Urban and Regional Planning (MURP) is January 5, 2019. The deadline for Ph.D. applicants is December 10, 2018. The same deadlines apply for both domestic and international students. Please view the application checklist for MURP and PhD applicants. Do official transcripts need to arrive by the application deadline? Yes, official transcripts must be received by the Admissions Office on or before the application deadline. Please note that this is NOT a postmark deadline. What should I do with my junior college transcripts? Please upload unofficial copies of all junior college transcripts to the Transcript Upload section of the Online Application, despite contradictory language in the description of that site. We understand that applying to graduate school is an expensive process. The fee for domestic applicants is $105. The fee for international applicants is $125. Waivers will only be granted to those who fall under one of the categories listed on the UCLA Graduate Division application. The university will grant need-based fee waivers for currently-enrolled students who are receiving financial aid. You must submit a letter from your financial aid officer indicating your enrollment and financial aid status and that payment would be a hardship. This letter should be uploaded directly to the application; select “Fee Waiver” as your method of payment. Your application will NOT be reviewed until your waiver is approved. Please follow up with the department no sooner than January, at least two weeks after you complete the application. How can I verify that my GRE scores and transcripts have been received? We receive a high volume of materials and cannot verify receipt of materials over the phone. If anything is missing from your application, the staff will contact you in January. At that time, you may submit your missing material(s) without penalty. When will I hear from the Department regarding the status of my application? Admission notification and fellowship letters are usually sent out in March. Please do not contact the Department regarding admission decisions until after March 15. When do I need to notify the Department about whether or not I will be attending UCLA? The national deadline to inform all graduate schools of your decision is April 15th. No, the Department of Urban Planning does not defer admissions. You will have to re-apply to the program. Does the Department admit new students mid-year? No. Students are admitted to the fall term only. How does the letters of recommendation system work? Click the “Recommendation Provider List” button. Insert the name and contact information of each recommendation provider. Once the recommendation provider information is saved, an email will be sent to the online recommendation provider with an access code and instructions on how to proceed with the online recommendation. When the recommendation provider submits the form to our office it will become a part of your application. May I use a third-party vendor such as Interfolio to submit my letters of recommendation? 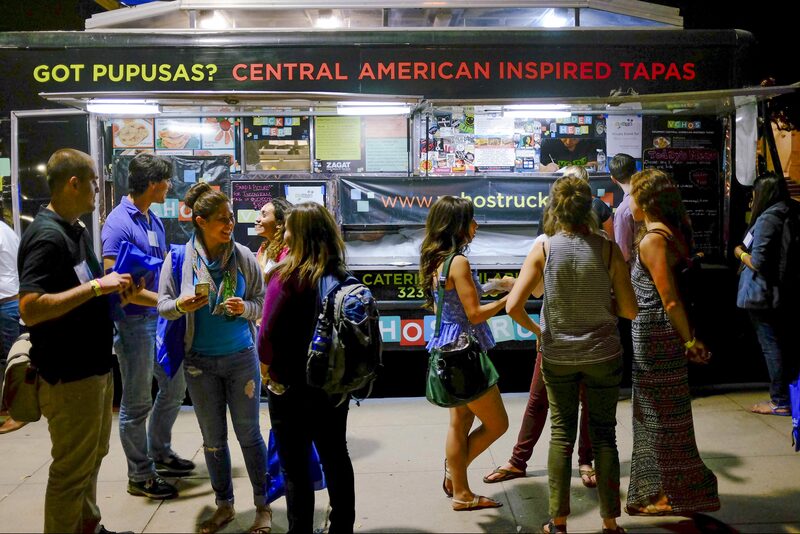 Such a vendor may send letters of recommendation directly to Sean Campbell via email (sean@luskin.ucla.edu). However, this method is discouraged because your application may be at a slight disadvantage as compared to other applicants who use the online submission process. Through a third-party system, your referees are not able to complete the rating piece of the evaluation. Those who are applying for a concurrent degree program may submit GMAT/LSAT scores in lieu of GRE scores. However, copies of the official score report must be provided by the applicant. The GRE institution code for UCLA is R4837 and the department code is 4402, titled “City and Regional Planning.” However, indicating a department is not necessary. Please make sure that the name indicated on your GRE report is exactly the same as the name on your application. Mismatched names will cause a delay in the review process of your application. I did not include the department code in my GRE submission. Will my score still reach you? Yes. 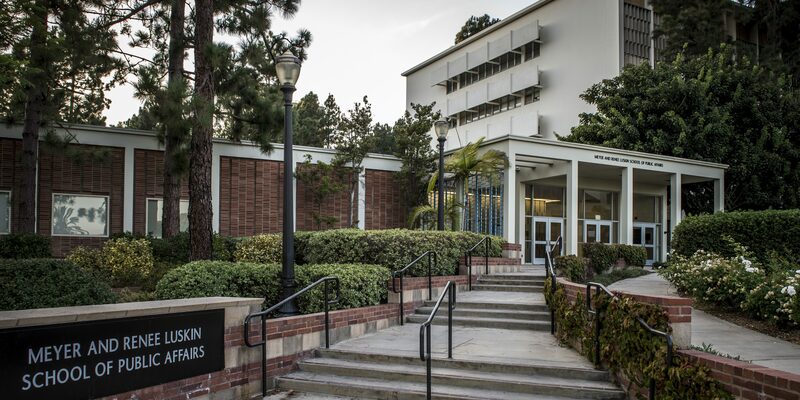 ETS sends both electronic and paper copies to UCLA when requested. No. We evaluate applicants holistically when making admissions decisions, weighing the undergraduate record, statement of purpose, letters of recommendation, and prior planning-related work experience above all else. The TOEFL is required for international applicants only. The minimum score required is 600 paper-based, 250 computer-based, or 100 internet-based. The UCLA Graduate Division requires the following minimum passing scores for each section on the internet-based exam: Writing 25, Speaking 24, Reading 21, and Listening 17. The TOEFL institution code for UCLA is 4837 and the department code is 97. Is the IELTS accepted in lieu of the TOEFL? Yes, the IELTS is accepted in lieu of the TOEFL. Please note that the minimum Overall Band Score for admission to the Department of Urban Planning is 7.0. What are the English language requirements for admission to UCLA? International applicants whose first language is not English must certify their proficiency in English when applying to UCLA, and, if admitted, upon arrival. What percentage of applicants are admitted? While the number of applications received each year varies, approximately forty percent of applicants are admitted. How can I strengthen my application for MURP? The strongest applications have a clear, focused statement of purpose, an impressive resume reflecting relevant planning experience, supportive letters of recommendation, and a solid undergraduate grade-point average (GPA). The average admitted-student GPA is 3.60, which we calculate based on your last two years of undergraduate work, major and non-major. The average GRE scores are 78th percentile for verbal, 63rd percentile for quantitative, and 68th percentile for writing. It is important to note that GRE scores are not weighted as heavily as the statement of purpose, GPA, letters of recommendation, and resume. Most of our students have worked in the planning profession in some capacity, though some enter directly following the completion of their undergraduate career, with internship and research experience. What qualifies as planning-related work experience? Any work you have done in the planning field, whether that be full/part-time employment, research, volunteer/organizing, etc, should be highlighted in your resume. If it is relevant to your development as a planner, it is relevant to our admissions committee. Is it possible to be admitted to the MURP Program with a GPA of less than 3.0? Applicants with a junior/senior GPA below 3.0 may be given provisional admittance to the program if other aspects of their applications are strong. An outstanding record in any area may compensate for poorer performance in another. Students accepted provisionally must achieve a minimum GPA of 3.0 during their first quarter in the program. Does the Department of Urban Planning offer an undergraduate degree? No, but we offer an array of undergraduate courses and a minor in Urban and Regional Studies. Does the Department of Urban Planning offer part-time degree programs? No. We offer full-time Master’s and Ph.D. degree programs. Some students are able to work part-time while taking a full course load. What is the national ranking of the Department of Urban Planning? Our program ranks among the top schools in the country, as well as internationally. According to Planetizen, the MURP program at UCLA is currently ranked 4th in the United States (2017). What is the duration of the MURP degree program? The MURP degree is normally a two-year program. Is the MURP degree accredited? Yes, it is fully accredited by the Planning Accreditation Board, a joint undertaking of the American Institute of Certified Planners and the Association of Collegiate Schools of Planning. Where can I find a list of course syllabi and schedules? For sample course syllabi, click here. For course schedules, click here. How many students are currently (2016-2017) enrolled in each of your programs? Does the Department offer Concurrent Degree Programs? the Master in Public Health, M.P.H. How do I apply to one of the concurrent degree programs? Where can I obtain more information on registration fees and tuition? Where can I find information on establishing California residency for tuition purposes? What are the funding opportunities for MURP students? Please see the PDF under MURP resources above. 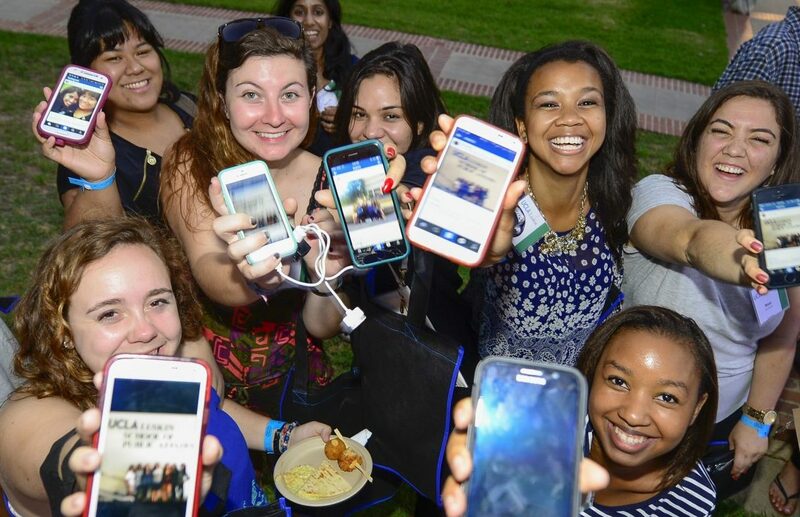 Click here for information on the graduate cost of attendance at UCLA and details on available financial aid and scholarship opportunities. 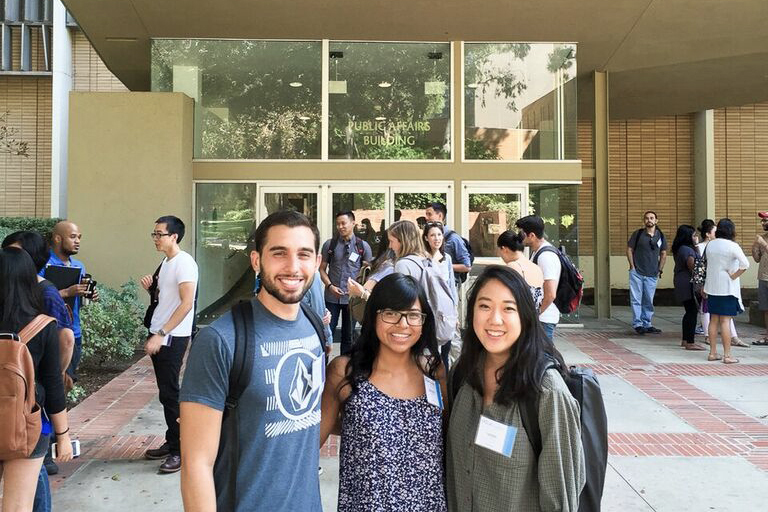 Detailed information on student fees and teaching assistantships can be found at the UCLA Graduate Division website. How can I be qualified for fellowships or financial aid? You are automatically considered for departmental merit-based fellowships when you submit your online graduate application. There is no separate application. To be eligible for consideration for need-based financial aid, you must complete the Free Application for Federal Student Aid (FAFSA) on or before the March 2 deadline. What are the funding opportunities for Ph.D. applicants? Teaching and research positions will most certainly be available to you to help with your cost of living. We hope that our PhD students would remain nearly fully-funded for the duration of their studies, by either fellowship awards (stipend) or assistantships (salary). It is encouraged that you communicate with faculty members with whom you would potentially work. How does funding change for international MURP students? Unfortunately UCLA has only a limited number of fellowships and assistantships for which non-U.S. graduate students are eligible. These are awarded to students who have demonstrated high academic achievement in their studies on this campus. International students at UCLA are not eligible for support based solely on need. Therefore, international students are strongly advised to secure funds from their own sources. All of our admissions materials are available on this website or by email. For further information, email Sean Campbell, Associate Director of Admissions & Recruitment, at sean@luskin.ucla.edu or call (310) 825-8957. Can non-residents, non-visa holders apply to the Urban Planning Programs? Yes! There are no citizenship requirements to apply to the either the MURP Program or the Urban Planning PhD Program. Are Undocumented/DACAmented applicants evaluated differently than legal residents? No. Background information and residency/citizenship status are not part of the application review process and have absolutely no bearing on an applicant’s admission decision. What resources are available to Undocumented/DACAmented Students at UCLA? UCLA is committed to ensuring that all students, regardless of their citizenship status, are receiving the resources that they need. The Undocumented Students Program serves as a hub to provide resources and support to all Undocumented/DACAmented students. What financial aid is available to Undocumented/DACAmented students? Financial aid opportunities are available to Undocumented/DACAmented students. Applicants should fill out a Dream Act application instead of a FAFSA, if able. Are there different application requirements for Undocumented/DACAmented students? No. The application is the same for all applicants. The welcome screen of the application will provide additional guidelines to those who are uncertain how to discuss their citizenship status.